2Novartis Pharmaceutical Corporation, East Hanover. Purpose: Around 30%-50% of kidney transplant recipients (KTR) on sirolimus discontinue treatment due to drug-related adverse events (AE) and ~23% on everolimus (EVR) discontinue treatment due to overall AE. The main cause for these AEs could be either drug dosage and/or high trough levels (C0). Here, we discuss the time to onset of these AEs and the relation to drug C0, and subsequent discontinuations from the US92 study (NCT01025817). Methods: In this 12-month, multicenter, open-label, non-inferiority study, de novo KTR were randomized (1:1) to receive EVR (C0:3-8 ng/mL) plus low-dose tacrolimus (EVR+LTac) or mycophenolate mofetil plus standard-dose Tac (MMF+STac) and induction with basiliximab or rabbit anti-thymocyte globulin. Tac target C0 range in EVR+LTac vs MMF+STac arms were 4-7 vs 8-12 ng/mL (Day 3), 3-6 vs 7-10 ng/mL (Month 2) and 2-5 vs 5-8 ng/mL (Month 6). 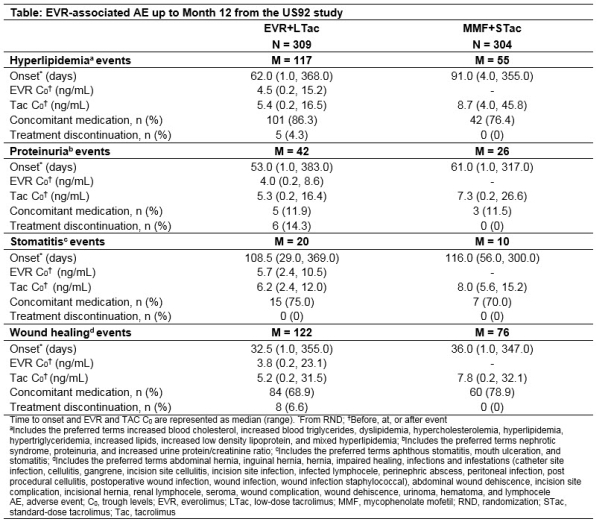 The time to onset from randomization, EVR C0 at onset (before/at/after event), rates of concomitant medication use and treatment discontinuation for hyperlipidemia, proteinuria, stomatitis, and wound healing events (WHE) were assessed. Results: More AEs were observed in the EVR+LTac arm with WHE and hyperlipidemia being the most common in both arms. Median time to onset was shorter in EVR+LTac vs MMF+STac arm (62 vs 91 days) for hyperlipidemia and comparable between arms for other 3 AEs. Median EVR C0 at onset was within target range regardless of AE and median TAC C0 at onset was above (stomatitis) or near the upper limit of target range in the EVR+LTac arm. Use of concomitant medication was frequent for treating hyperlipidemia (86.3% vs 76.4%), WHE (68.9% vs 78.9%) and stomatitis (75.0% vs 70.0%) in EVR+LTac vs MMF+STac arms. Discontinuation rates due to the 4 AEs were up to 14.3% in EVR+LTac vs none in MMF+STac arm (Table). Conclusion: Despite a higher incidence of AEs with EVR-based therapy, the regimen was well-tolerated and easily managed by concomitant medications. CITATION INFORMATION: Shihab F., Qazi Y., Peddi V., Shaffer D., McCague K., Patel D., Mulgaonkar S. Post-Hoc Analysis of Everolimus Trough Levels around the Onset of Related Adverse Events and Treatment Discontinuation in De Novo Kidney Transplant Recipients from the US92 Study Am J Transplant. 2017;17 (suppl 3). Shihab F, Qazi Y, Peddi V, Shaffer D, McCague K, Patel D, Mulgaonkar S. Post-Hoc Analysis of Everolimus Trough Levels around the Onset of Related Adverse Events and Treatment Discontinuation in De Novo Kidney Transplant Recipients from the US92 Study [abstract]. https://atcmeetingabstracts.com/abstract/post-hoc-analysis-of-everolimus-trough-levels-around-the-onset-of-related-adverse-events-and-treatment-discontinuation-in-de-novo-kidney-transplant-recipients-from-the-us92-study/. Accessed April 19, 2019.